Today, we got an email from a reader named Chris spec’ing out what I’m guessing is their dream 2019 Dodge Challenger SRT Hellcat RedEye. In doing so, they noticed that the “Lightweight Package” is sort of, um, curious. I decided to look into it a bit more, and from what I can tell, this might just be the most useless “Lightweight Package” ever offered on a car, since it sure as hell seems like it’d make the car actually heavier. Okay, so... front floor mats? I mean, I guess those aren’t heavy, but not having floor mats seems even less heavy to me. It looks like the rear floor mats are deleted, so that’s what, a couple of pounds? I suspect that’s a modification most owners could make on their own, too. A “lightweight washer fluid bottle?” Unless the original one was a cast-iron keg, I can’t imagine this saves that much weight? Maybe it has less volume, since the fluid is by far the heaviest part. And that “Tilt/Telescope Steering Column” is the manual one, without the motor of the powered one, so that should save about four pounds. So I guess there’s a little savings there? Maybe, what, five or six pounds? Maybe? See that? To get the Lightweight Package, you have to add the Power Sunroof, Widebody Package, and the Harman Kardon® Audio Group with Subwoofer. That adds a tidy $9,590 and, I suspect a good chunk of weight. But even if they do weigh less than the standard, I’m not sure it’s enough to overcome the added weight of the other required stuff. For example, the powered sunroof assembly probably weighs about 25 pounds, and that’s 25 pounds in the roof of the car, the place where you want extra weight the least. It seems that the Harmon Kardon rear subwoofers alone—not even the rest of the speakers or other hardware—weighs about 14 pounds, and I’m not really sure what the widebody kit weighs, but I am just about certain the number isn’t negative. So, even if we just factor in the sunroof and subwoofer, that’s 39 extra pounds. If we subtract the savings from the manual steering column and the floor mats, that’s still around 33 pounds, and if we’re generous and say that the lightweight windshield washer saves you, what, two pounds, that’s still 33 pounds more than if you never bothered with the Lightweight Package at all. I reached out to Dodge to see if I can get some official numbers, and I’ll update this if I do. I can’t see any way they’re going to be able to do any math that says the Lightweight Package is actually lighter than a base car without the sunroof and sound system, though. Maybe they’ll surprise me? This is really baffling. Why didn’t they add rear seat delete to the Lightweight Package? They’ve offered that separately on Challengers, and that would drop the car by around over 50 pounds, easy. 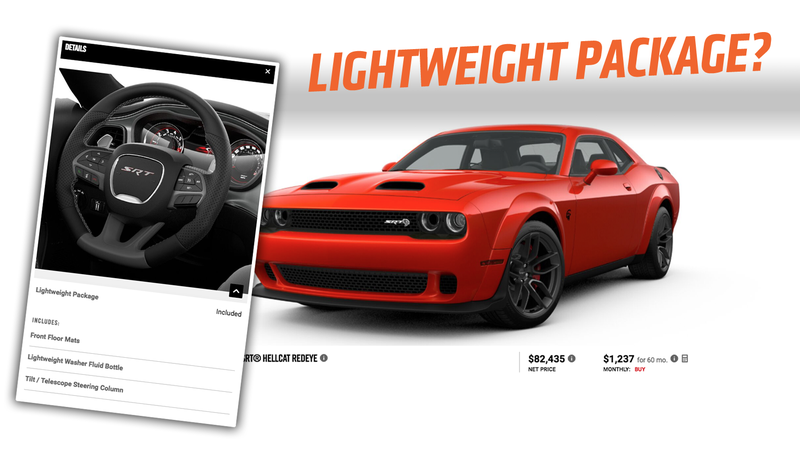 As it is, the Lightweight Package on the 2019 Challenger SRT Hellcat Redeye Devil Demon Monster Musclebeast or whatever the hell this thing is called seems like an almost $10,000 way to add over 30 pounds to the car. Maybe I’m wrong, but it sure as hell looks like that. You could accomplish the same thing with about $30 worth of peat moss bags in the trunk, only that way the weight would actually be in a better place on the car. And, you’d have some peat moss.